The NOVA special Secrets of the Sun ran Wednesday night, highlighting the SDO data and scientists. You can still watch it at WGBH. 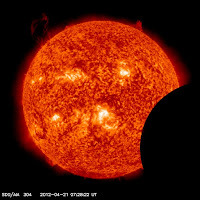 The SDO Weekly report for April 26, 2012 was pretty short: The FOT supported the lunar transit on 4/22. They also supported the monthly Atmospheric Imaging Assembly (AIA) Guide Telescope (GT) Calibration on 4/26. Yesterday SDO had another lunar transit. Here is an example of this grazing transit. Good Morning America will feature Camilla SDO and the crew that sent her into the stratosphere during a solar storm. This has already been reported on discovery.com, huffingtonpost.com, and BBC.co.uk. I liked the movie of the balloon popping. Check it out! Here is a link to the segment about the balloon launch. Last Wednesday and yesterday (April 11 and 18, 2012) we performed several spacecraft maneuvers to help calibrate our instruments. On April 4 we did an EVE cruciform and an AIA bakeout. This means the Sun moves back and forth and up and down. AIA images may be noisy (because the CCDs were warmed up to reduce contamination) and the Sun absent during this maneuver. HMI images may not show the Sun, or show it whizzing by as SDO moves. On April 18 SDO did an EVE field of view and HMI flatfield maneuver. While we do these maneuvers the data may be unavailable but by doing these maneuvers we keep the instruments healthy. The Helioseismic and Magnetic Imager (HMI) instrument, one of three instruments on board NASA's Solar Dynamics Observatory (SDO), is making precise measurements of the solar limb to study the shape of the Sun. Twice a year, the SDO spacecraft performs a 360 degree roll about the spacecraft-sun line. This roll maneuver allows us to remove the instrument optical distortions from the solar images taken by HMI to precisely determine the solar limb. Thanks to the high resolution observations of the HMI instrument, solar scientist can measure if the Sun's sphere is changing over time as a result of the solar cycle. On April 4, 2012 SDO performed its 6th roll and the accumulated data is being studied and reviewed and will later be published in a paper. The FOT performed the SDO Station Keeping maneuver number 4 (SK4) on 3/28. We used 69 grams of propellant to keep SDO within our assigned box. An HMI roll was performed this morning (April 4) starting at 0550 UTC. AIA images are again current. AIA images in several channels are delayed in processing. They should be up-to-date soon.